Congratulations – you won 600 points. Wait – not so fast! Labs have long sought a complete solution to capture the actual movement between plates and tube racks. In the average lab, the various stages of testing and processing require samples to be moved back and forth. LabVantage Advanced Storage and Logistics (ASL) grids are comprised of movable position tube racks. Historically there was no way to automate and track the transfer of contents to fixed-well plates for testing. LabVantage Arrays typically consist of fixed-well plates. There has also been no way to automate the movement of well content back to tube racks for storage after processing. 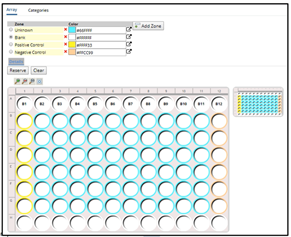 In LabVantage 8.4, users can take advantage of ASL-array integration to seamlessly transfer content across the various arrays and storage in labs. Multiple types of transfer are possible. Samples can be transferred from storage tube racks to assay plates to test DNA concentration, RNA quality, or perform other testing. After processing, content can be moved back from arrays to ASL grids, for storage. And it can also be moved between ASL grids, for aliquoting tube racks in high throughput labs. With this feature, lab technicians can use a liquid-handling robot to move samples from tube racks to arrays, by predefining mapping between the source and target arrays or tube racks. Automating this task frees you from the risk of human error, while speeding up the process overall. An added bonus is that recording the transfers enables you to trace the genealogy of the ASL grids and arrays. In LabVantage 8.4 ASL grids now have an associated Array Type and Array Layout, recognized by the Track Item Storage Management (TISM) page. 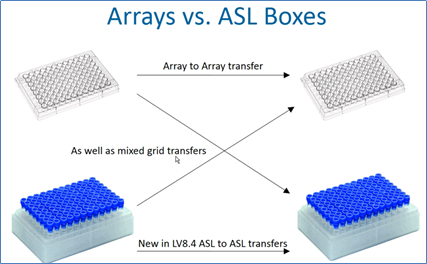 Transfers between various arrays are automated by extending the existing Array Transfer Method definitions to include ASL grids as source or target array types. Samples can be transferred “whole” when physically moved from source grids to target grids. Additionally, you can transfer part of a sample from the ASL grid position as an aliquot or derivative of the source sample and place it into either the target array well or ASL grid position. Volume is automatically calculated, including the source volume to be decremented and diluent volume calculations when concentrations change during transfer. You can create child boxes by choosing transfer methods based on the source ASL grid selected. Volume can be managed when creating child samples. Likewise, reagents can be added to child samples, with automatic volume management. 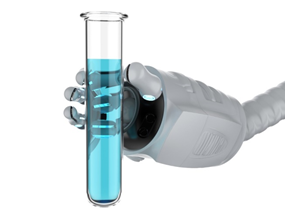 LabVantage 8.4 allows matching instrument selection, and generates the Liquid Handling Robot (LHR) report. You are also free to choose from preexisting targets or create new ones. Genealogy is efficiently tracked via the persistence of the execution details for each transfer. Furthermore, the relationship between the ASL grids and arrays persists and is depicted visually. To find out more about how ASL-array integration and LabVantage 8.4 can benefit your lab, contact us today.